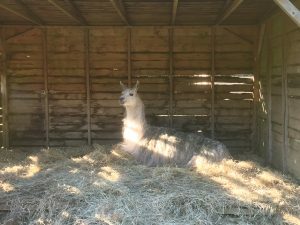 We have had llamas now for almost 14 years and I absolutely love them. They are beautiful animals. Even though they get bad press because of their habit of spitting. 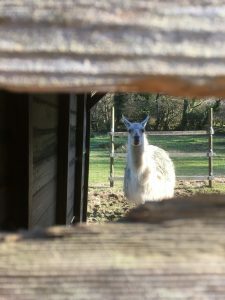 In spite of being caught in the crossfire of two grumpy, spitting llamas many times over the years, I still love them. 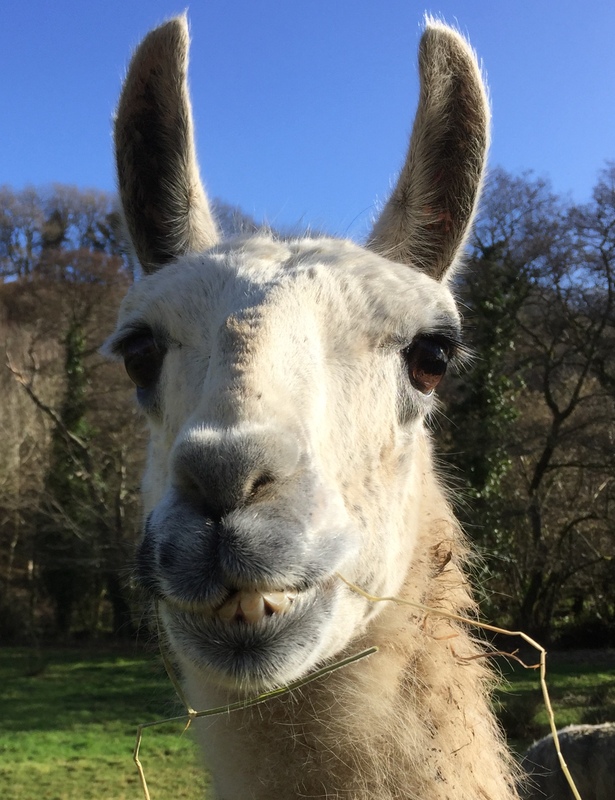 Because when a llama is happy, it makes the cutest humming sound ever. And that’s most of the time. They’re relatively placid animals and very easy to look after. Perfect for keeping the grass in the field under control. They’re also quite good at guarding sheep and chickens from predators. 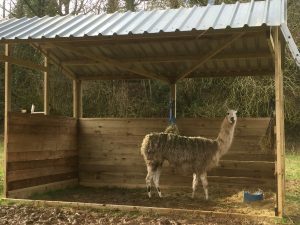 Before our llamas arrived, we had a field shelter built for them. As you can imagine, after 14 years, it was looking a little dilapidated. 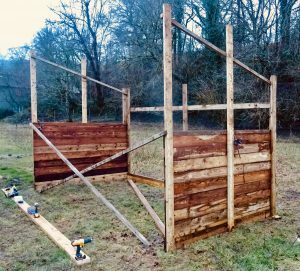 Last year, we built our chickens a big, covered run. 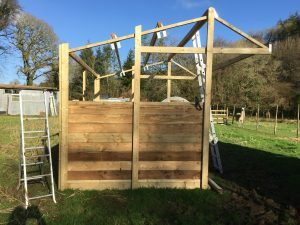 We also built a hay shed to store the llama hay and a house for our new ducks. After much debate, we decided it was time to tackle something bigger. It was time to build the llamas a new house. This was the design we came up with. Based on a stable for horses, we figured it would be a suitable design for the llamas. 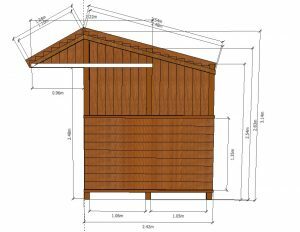 We managed to have a good snoop around a similar design at our local farm shop and after much discussion we finally put in an order for the wood. I have to confess, I had to sit down and have a strong cup of tea when I heard how much the wood was going to cost. Despite the panic-inducing price of the wood, however, making it ourselves was going to cost half what it would cost to buy one ready made. 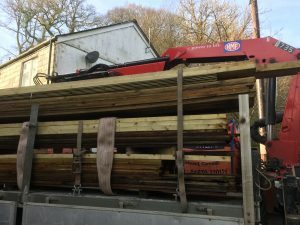 A large truck delivering the wood arrived just before Christmas and on the 28th of December 2017 we began laying out the pieces of the giant jigsaw that would become the new field shelter. Our old field shelter had a wooden floor. It was the first thing that caused problems. When the wood became wet and rotten, eventually the llamas managed to put holes in the floor. Llamas weigh a lot! 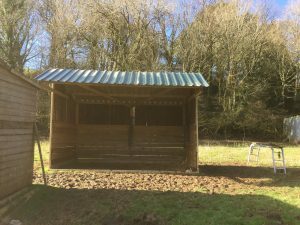 Having patched the floor so many times, we were keen to avoid making the same mistake with the new shelter. So we didn’t put a floor in. 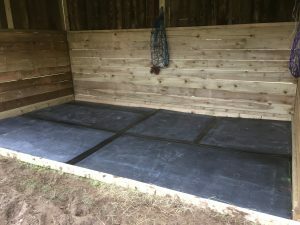 To stop the inside of the shelter from becoming too muddy and to give them something soft to sleep on, we sourced some fabulous mats from the internet. The weather in January was horrible. 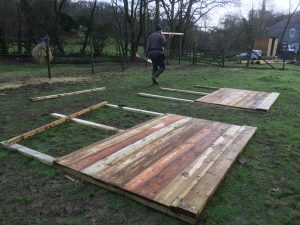 It rained for most of the month and finding gaps in the weather during the weekends was challenging but we managed to work on it most weekends. The boys kept a close eye on the progress of their new house. I’m not entirely sure what they made of all the banging and drilling a sawing, mostly they just carried on munching on their hay and enjoying the fine weather when it appeared. Leo checking out the new field shelter. So there you have it, the boys have a new house. There are still a couple of little bits to do. The roof cap needs to be fitted but this entails climbing on the roof. We were so cold on Sunday afternoon we decided it wasn’t the best time to be risking life and limb so we will do that next weekend. We also have to take down the old field shelter. Some of the wood is quite rotten and it needs to go before one of the llamas hurts themselves. Hopefully, there will be some decent wood left that we can recycle and make into something else. The rest we can use on the fire. 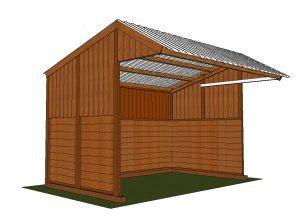 If anyone would like the dimensions and a wood ordering list etc to build a field shelter like this, we are putting together a detailed explanation on how to do it and when it’s finished, I will put up a link. My First Attempt At Taking Flat Lay Photographs.